I'm having a good ole time with The Hogwarts Challenge hosted by Bunnitaz over at Worth Reading It? I'll be sad to see it end in August. Before it finishes, though, our wonderful hostess is giving us all a chance to boost our points big time. The mini challenge is too complicated to explain here, but since it has to do with summer reading lists, I'm going to post the one I'll be using. I had a hard time finding any official summer reading lists (except for Oprah's, of course), but I liked the selections on this one from Parkway High School in Missouri. Students there are encouraged to read at least three of the titles before the school year begins. It's not exactly beach reading, either. The lists for all grades are below - I've crossed out the ones I've read previously. Which have you read? Which do you think I need to read? Adams, Douglas. The Hitchhiker’s Guide to the Galaxy. Anaya, Rudolfo A. Bless Me, Ultima. Blackwood, Gary. The Year of the Hangman. Covey, Sean. The Seven Habits of Highly Effective Teens. Cox, Lynne. Swimming to Antarctica. Dessen, Sara. The Truth about Forever. Krakauer, Jon. Into Thin Air: A Personal Account of the Mount Everest Disaster. Murdock, Catherine Gilbert. Dairy Queen. Nolan, Han. Dancing on the Edge. Nye, Naomi Shihab. 19 Varieties of Gazelle: Poems of the Middle East. Peck, Richard. The Teacher’s Funeral. Philbrick, Nathaniel. In the Heart of the Sea: The Tragedy of the Whaleship Essex. Schaap, Jeremy. Triumph: The Untold Story of Jesse Owens and Hitler's Olympics. Uchida, Yoshiko. Desert Exile: The Uprooting of a Japanese-American Family. Cary, Kate. Bloodline: A Novel. Collins, Billy (Editor). Poetry 180: A Turning Back to Poetry. Dillard, Annie. Pilgrim at Tinker Creek. Ehrenreich, Barbara. Nickel and Dimed: On (Not) Getting by in Boom-Time America. Haddon, Mark. The Curious Incident of the Dog in the Night-Time. Jeter, Derek. The Life You Imagine: Life Lessons for Achieving Your Dreams. Kooser, Ted. Delights and Shadows. Larsen, Judy Merrill. All the Numbers. Naidoo, Beverley. Out of Bounds: Seven Stories of Conflict and Hope. Poe, Edgar Allen. Selected Tales. Spiegelman, Art. Maus: A Survivor's Tale I and II. Thomas, Marlo. The Right Words at the Right Time. Berthon, Simon. Warlords: An Extraordinary Re-creation of World War II Through the Eyes and Minds of Hitler, Churchill, Roosevelt and Stalin. Blumenthal, Karen. Let Me Play: The Story of Title IX, The Law that Changed the Future of Girls in America. Brooks, Martha. True Confessions of a Heartless Girl. Callahan, David. The Cheating Culture. Collins, Billy. Sailing Alone Around the Room: New and Selected Poems. Danticat, Edwidge. The Farming of Bones: A Novel. De Botton, Alain. The Art of Travel. Erdrich, Louise. Tracks: A Novel. Gladwell, Malcolm. Tipping Point: How Little Things Can Make a Big Difference. Larson, Erik. The Devil in the White City: Murder, Magic and Madness at the Fair that Changed America. Matheson, Richard. I am Legend. Picoult, Jodi. My Sister’s Keeper. Schlosser, Eric. Fast Food Nation. See, Lisa. Snow Flower and the Secret Fan. Ambrose, Stephen. Citizen Soldiers: The U.S. Army from the Normandy Beaches to the Bulge to the Surrender of Germany. Bissinger, Buzz. Three Nights in August: Strategy, Heartbreak and Joy Inside the Mind of a Manager. Chandrasekaran, Rajiv. Imperial Life in the Emerald City. Fleming, Ian. Casino Royale: A James Bond Novel. Foer, Jonathan Safran. Extremely Loud and Incredibly Close. Goodwin, Doris Kearns. No Ordinary Time: Franklin and Eleanor Roosevelt: The Home Front in World War II. Guterson, David. Snow Falling on Cedars. Hughes, Langston. The Collected Poems of Langston Hughes. Kingsolver, Barbara. The Poisonwood Bible: A Novel. Larkin, Emma. Finding George Orwell in Burma. Mortenson, Greg. Three Cups of Tea. Sittenfeld, Curtis. Prep: A Novel. Xiaolong, Qiu. Death of a Red Heroine. It's the weekend again, which means it's time for another Book Blogger Hop. Yay! These are so much fun. 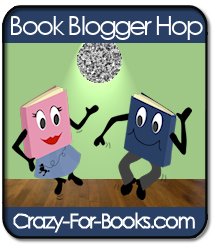 It's a fabulous opportunity to find new book blogs and "meet" other bloggers. Join the fun by clicking over to Crazy For Books. This week's question is: What are you reading now? You're never going to believe my answer - nothing. I finished Beauty by Robin McKinley this morning. I really enjoyed it. Next up is The Space Between Trees by Katie Williams. I've sneaked a peek or two, but haven't actually started reading it yet. I'm excited to see what it's all about. Just hopping by to say hello. Thanks for stopping by my blog :) I just became a new follower. I adore Robin McKinley. My favorite of hers is Sunshine. You might want to fix that first link. Hope to see you soon! I think it's time you committed to finish Ender's Game. The audio production that was made for the 20th anniversary of the book is excellent and easy to listen to. I have read and loved Rebecca, Sense and sensibility, and The Glass Castle. I want to read Into Thin Air and Three Cups of Tea. I only read "My Sisters Keeper" and "The Glass Castle." The "Glass Castle" is about a very unusual and strange family. I found it quite interesting. Thanks for finding me on the hop! I am now following you!! Wow! That's an impressive summer reading list. My stepson had to read one book going into 7th grade, and he chose Slob by author I can't remember. My stepdaughter is going into AP English in high school, and she had to read 2 books, so she read five off the list instead. Can't even tell you how many she's read total this summer. She's got me beat, that's for sure! She just finished To Kill a Mockingbird and a book called Bruiser today. I'm just trying to get through the last 50 pages of Beatrice and Virgil. Now that I've typed your "ear off." Happy Hopping!